Lawyers for Christine Blasey Ford said that since going public with her allegation, she has been "the target of vicious harassment and even death threats." WASHINGTON — The scheduled hearing next Monday on Brett Kavanaugh's nomination to the Supreme Court appeared to be in even further doubt Tuesday, as lawyers for Christine Blasey Ford, who has accused Kavanaugh of sexually assaulting her when they were in high school, said that she wants an FBI probe into the incident before testifying. In a letter addressed to Senate Judiciary Committee Chairman Chuck Grassley, R-Iowa, Ford's attorneys wrote that "a full investigation by law enforcement officials will ensure that the crucial facts and witnesses in this matter are assessed in a nonpartisan manner, and that the Committee is fully informed before conducting any hearing or making any decision." Her attorneys, Debra Katz and Lisa Banks, also said their client has been "the target of vicious harassment and even death threats," and that as a result, "her family was forced to relocate out of their home." "We would welcome the opportunity to talk with you and Ranking Member Feinstein to discuss reasonable steps as to how Dr. Ford can cooperate while also taking care of her own health and security," they added. Uncertainty had begun to swirl around the hearing after Ford did not immediately respond to the invitation that Grassley extended Tuesday morning to both Kavanaugh and Ford to testify before the Judiciary Committee on Monday. Kavanaugh accepted, but Ford, a research psychologist, and her attorneys remained mum throughout the day as Republicans and Democrats fought over whether the hearing should move forward without investigation by the FBI. Responding to Ford's lawyers in a statement Tuesday night, Grassley said that no law enforcement investigation was warranted, and that the invitation for her to testify Monday "still stands." How will sexual assault claims affect Kavanaugh's confirmation? “Dr. Ford’s testimony would reflect her personal knowledge and memory of events. Nothing the FBI or any other investigator does would have any bearing on what Dr. Ford tells the committee, so there is no reason for any further delay,” he said. Sen. Bob Corker, R-Tenn., who had supported delaying a vote on Kavanaugh's confirmation pending testimony from Ford, said in a tweet Tuesday night that the chamber should move forward if she doesn't appear Monday. Ford's request for a law enforcement investigation prior to appearing before the panel echoes the calls of several Democrats on the Judiciary Committee on Tuesday, who argued that any public hearing should wait. “We should honor Dr. Blasey Ford’s wishes and delay this hearing," the panel's top Democrat, Sen. Dianne Feinstein of California, said in a statement following news about the letter. "A proper investigation must be completed, witnesses interviewed, evidence reviewed and all sides spoken to. Only then should the chairman set a hearing date." Senate Minority Leader Chuck Schumer, D-N.Y., said in a statement that he supports Ford in wanting an FBI probe first. "I strongly support Dr. Ford’s call for an FBI investigation before a hearing is held. An immediate FBI investigation is not only consistent with precedent, it is also quite clearly the right thing to do," Schumer said. Hillary Clinton, who has spoken out against Kavanaugh's confirmation, said Tuesday night on MSNBC's "The Rachel Maddow Show" that she also endorsed a probe. “I think you can’t avoid the appearance of insult if you don’t have an investigation so that she is, you know, able to be evaluated fairly,” Clinton said. The FBI, however, isn't likely to conduct any investigation into the veracity of Ford's claims, unless the White House asks for it. Several current and former Department of Justice and FBI officials told NBC News that has always been the practice. President Donald Trump indicated Tuesday that he did not currently plan to make that request. "I don’t think the FBI should be involved because they don’t want to be involved," Trump told reporters at the White House. "If they wanted to be, I would certainly do that." Democrats also lambasted the GOP for rushing the process and for not calling additional witnesses beyond Kavanaugh and Ford. Many drew parallels between the current situation and how allegations made by Anita Hill 27 years ago were handled after Hill came forward with sexual harassment allegations against Justice Clarence Thomas during his Supreme Court confirmation hearings. Schumer, speaking on the Senate floor Tuesday morning, said that it would be unacceptable for senators to hear from witnesses just a day or two before being asked to vote on the nomination. He also called it "inadequate" for the committee to hear from only two witnesses on Monday and said that Mark Judge — who Ford said was a witness to the incident — should also testify. "Let's not repeat the mistakes of the Anita Hill hearings," Schumer said. "Let's call all the relevant witnesses." 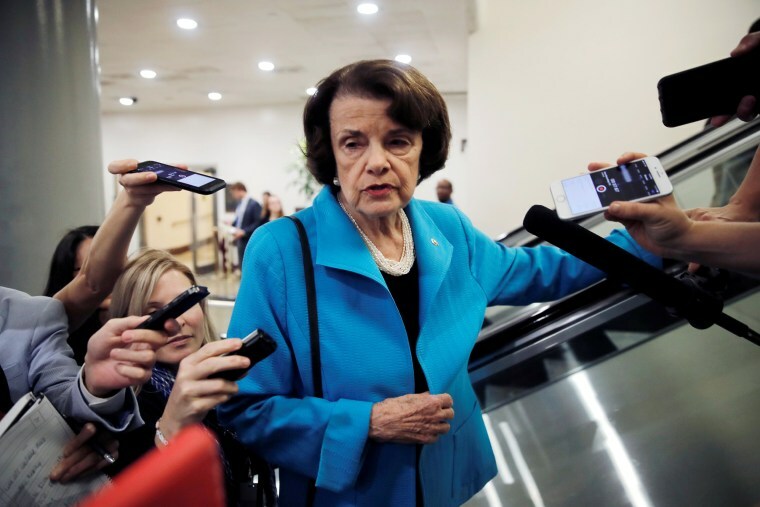 Ford's allegation initially came to light in a letter sent to two California Democrats, Feinstein and Rep. Anna Eshoo, and was subsequently reported in The New Yorker. In that article, Ford asked not to be identified, but in a Washington Post story published Sunday, she stepped forward. She alleged that Kavanaugh and another person drunkenly "corralled her into a bedroom during a gathering of teenagers" in the suburbs of Maryland one summer in the 1980s. "I thought he might inadvertently kill me," she said of Kavanaugh. Kavanaugh denied the incident had occurred. “This is a completely false allegation," he said in a statement in which he offered to speak to the Judiciary Committee again to "defend my integrity." "I have never done anything like what the accuser describes — to her or to anyone. Because this never happened, I had no idea who was making this accusation until she identified herself" in The Post, he said. Judge has denied the allegation that he was a witness to the incident. In a letter to Grassley and Feinstein on Tuesday, Judge's attorney, Barbara Van Gelder, shared a statement from Judge again refuting Ford's account and saying he did not wish to speak publicly about the incident. "I did not ask to be involved in this matter nor did anyone ask me to be involved. The only reason I am involved is because Dr. Christine Blasey Ford remembers me as the other person in the room during the alleged assault," the statement said. "In fact, I have no memory of this alleged incident. Brett Kavanaugh and I were friends in high school but I do not recall the party described in Dr. Ford's letter. More to the point, I never saw Brett act in the manner Dr. Ford describes." Feinstein, meanwhile, criticized the FBI and White House on Tuesday for "failing to take even the most basic steps" to investigate Ford’s allegation. "What's worse at that time, President Bush asked the FBI to do its job and perform an investigation looking into Anita Hill's allegations, which it did. Now, under the Trump administration, Republicans want to do even less by blocking any investigation into Dr. Ford's allegations,” she said. "I'm disappointed the FBI and White House are failing to take even the most basic steps to investigate this matter." Hill, in an op-ed published by The New York Times on Tuesday morning, also compared her ordeal to the present scenario. "It's impossible to miss the parallels between the Kavanaugh confirmation hearing of 2018 and the 1991 confirmation hearing for Justice Clarence Thomas," she wrote. "In 1991, the Senate Judiciary Committee had an opportunity to demonstrate its appreciation for both the seriousness of sexual harassment claims and the need for public confidence in the character of a nominee to the Supreme Court. It failed on both counts." Hill recommended that the panel "demonstrate a clear understanding that sexual violence is a social reality to which elected representatives must respond," conduct a "fair, neutral and well-thought-out" process and "not rush these hearings." Sen. Orrin Hatch, R-Utah, tweeted Tuesday that "none of this was necessary had these accusations been given to the FBI 6 weeks ago for an apolitical investigation out of public eye." "But because Republicans and Kavanaugh himself first heard them in the media there really was no alternative," he added. Hatch told NBC News Monday that Ford is "mixed up," and called Kavanaugh "honest" and "straightforward." Back in 1991, Hatch had said he felt there was "no question" Hill had lied during the hearing and that her story was "too contrived." "There's no question in my mind she was coached by special interest groups," he said in an October 1991 interview. "Her story's too contrived. It's so slick it doesn't compute."